Throughout her freshman year at Dartmouth, Rachel Patel ’17 was interested in becoming involved with scientific research. She was drawn to the College’s Women in Science Project, a program specifically targeted towards women attracted to the sciences and one of about a dozen single-gender groups on campus. Other organizations on campus vary widely in the gender makeup of their membership. For many clubs, the gender ratio of their members is not as important as the overall mission of the organizations. A survey conducted by The Dartmouth received responses from 18 different clubs across campus. All respondents reported they were not surprised by the gender composition of their respective clubs and organizations. Thirty-nine percent of clubs that took the survey reported that gender makeup was not at all an issue to the members in the club, 39 percent voted it was of slight to mediocre importance and 22 percent said that gender makeup was of utmost significance to the members. Patel is one of 200 to 250 women in WISP. Former assistant dean at the Thayer School of Engineering Carol Muller ’77 and the late Karen Wetterhahn, who was a chemistry professor and associate dean of the arts and sciences, founded the program in 1990 in an effort to address the underrepresentation of women in the sciences. At WISP’s 25th anniversary event in April, Muller said that when she assumed her position at Thayer, she was surprised to find very few engineering majors were women and Thayer only employed one female faculty member. When WISP was founded in 1990, only 45 women majored in STEM subjects, but by 2015 that number more than doubled, with 114 women graduating in the sciences. Through WISP, women apply for scientific research internships with faculty members and participate in peer mentoring programs with other women of different class years. As part of her involvement with WISP, Patel assisted in at Dartmouth-Hitchcock Medical Center’s bioinformatics department and served as a WISP mentor. She is now one of two peer mentor coordinators for the program. WISP mentee Rachel Martín ’19 said she thinks that limiting this program to women does not adversely affect males or limit their options for research. Programs like the First Year Research in Engineering program are open to everyone, so she does not believe men are at any disadvantage in terms of pursuing research opportunities at the College. Another single-gender group, Women in the Wilderness was originally founded to promote female leadership in the outdoors and foster discussion about the value of empowering women through outdoor trips. Molly Ryan ’17 leads Women in the Wilderness and is one of 264 women involved in the club. She said that the gender gap in the larger outdoor community is striking to her and due largely to societal and historically based gender norms. Traditionally we conceptualize the outdoors as a male realm, and so this club seeks to allow for female mentorship and involvement in nature. Women lead all trips, but students, regardless of gender identity, are welcome to attend trips and feeds. In this way, Women in the Wilderness fosters a community based on friendship and empowerment that allows women and men to learn from each other in a positive environment, Ryan explained. Women in Computer Science president Kaya Thomas ’17 also said her club began in 2012 as a way for women taking computer science classes to get to know each other. Men usually grouped together for assignments and projects, so it was important for females to support and form community with each other, which contributed most to Women in Computer Science being limited to women. The group, which has 15 to 30 active members, often hosts a variety of events for women in the field, including dinners for women to get to know professors, most of whom are male, and develop relationships that often evolve into mentorship and internship opportunities. There are also events which educate women on how to build a resume, as well as recruiting events, in which computer science companies come to campus to talk about internships and full time jobs, and casual meetings where women can get to know each other better. Apologia, Dartmouth’s journal of Christian thought, has a staff and leadership that oscillates between 15 to 20 people of an equal gender ratio, editor Jake Casale ’17 said. The organization releases two publications each year and hosts a series of engagement events each term. Casale said the organization likely attracts equal numbers of men and women because its mission has the potential to be appealing to everyone, regardless of gender. It is a space where members’ voices feel heard and participants feel they have an active part in the dialogue they are trying to foster on campus, he said. 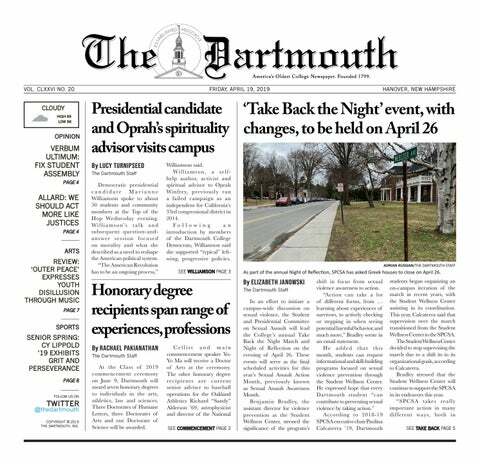 The Dartmouth Business Journal, another campus publication, also has equal membership among men and women. The organization publishes dozens of articles in print and online that cover a range of topics, including economics, psychology, finance and government. In terms of gender, the club has equal gender representation among writers, which president Joseph Bernstein ’17 said he thinks is due to equal interest in business among males and females. However, the club’s leaders are 60 percent male and 40 percent female, he said. Bernstein is also president of the Dartmouth Investment and Philanthropy Program, which he said is 85 to 90 percent male. The club manages an equity fund of $400,000, hosts programs on managing stocks and investment and choose non-profits to donate to each year. Bernstein said he believes this overwhelming male presence to be a result of the other business opportunities women are afforded at the College. Clubs like Smart Women’s Securities and Women in Business strongly attract women, he said. “It’s not that males are better investors than females,” Bernstein said. In contrast, Dartmouth Random Acts of Kindness president Kaitana Martínez ’16 said her club’s members are predominantly female. The ratio of women to men is approximately four to one. This ratio could be partially attributed to her club’s theme, which can be related to the stereotypical female role of care and service, Martínez said. Regardless of the primarily female participation, Martínez said the club does still have male involvement, though she wishes there were more men involved. She thinks that if more males participated in the club, the organization would have a broader perspective. Club projects would be a little different, the dynamic of weekly meetings would be distinct and the music choice would also differ slightly. “We probably wouldn’t listen to the Disney Pandora station as much,” she said.